Yesterday was a time of mixed emotions. A day of happiness and sorrow. I was torn and conflicted. 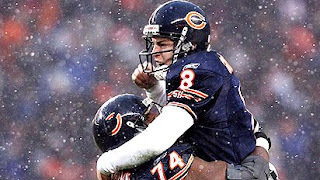 Being a Bears fan since birth, I was elated to see them trounce the Saints. Seeing them on the road to the Super Bowl for the first time since I was 8 is just awesome. I can't wait. But as the fantasy football owner of Drew Brees and Deuce McCallister, I was forlorn. I'd be excited that the Bears D got a sack, but sad at the same time. I'd cheer when Brees threw a touchdown, and then feel bad. I was pratically schizophrenic. It was a tough day. In the end, I lost the Super Bowl 70-57. I would have never believed you if you told me in September that the big point producers in our Fantasy Football Super Bowl would be Chicago Bears. I had two Bears on my team (Benson and Gould) and had wanted to draft Berrian but my opponent got him first. Althought I was unsure about starting both Benson and Gould, they were my two big producers after Brees (19 points). But still, they weren't enough to deflect the damage done of my opponent's two Bears: Thomas "I'll sit out a quarter but still rush for 123 yards and 2 TDS" Jones and Bernard "Circus Catch" Berrian. As is my reaction to any loss or failure, I want to beat myself up for it. But honestly, there's not much I could have done differently. I went into the draft with Brees, McCallister and Harrison and drafted the rest of the guys. In hindsight, I could have dropped McCallister in favor of Reggie Bush or Joseph Addai. I could have not kept Harrison and used my first pick on Bernard Berrian and skipped Reggie Wayne in favor of Dallas Clark, but if there's studs on the table I am going to go with them. Never would I have expected studs like McCallister (who rushed for like 500 yards last week), Harrison (who had 145 yards and 2 TDs vs. the Patriots earlier this season) or Wayne to all let me down. But in hindsight, it seems that instead of drafting these usual frequent studs, I should have drafted Jeff Saturday, Logan Mankis and Dan Klecko. Yah, they're linemen...but at least they scored. So, I don't have any regrets. I made it to the Super Bowl. And the better team won. In the off-season, I'll make some organizatonal changes and come back stronger. Heck, the Dallas coaching job just opened. If they hear about my managerial record, I might get the call. "If there's studs on the table I am going to go with them." Me too, Todd. Me too. Nice work, Dreamer. Nice work.